Originally published on planecrashgirl.ca on 15 April 2015. RCAF Hawker Hurricane 1359. Photo by Dr. Michael Deal. In July 2013, I was contacted by Byron Ruby about an aircraft he had found on his property near Cochrane Pond, Newfoundland. Unfortunately for me, I was working at a summer camp that July, and could not get the time to go out to the site. So I contacted by doctoral supervisor, Dr. Michael Deal, and asked if he was interested in going to the site. RCAF Hawker Hurricane 1359. Photo by Byron Ruby. Visiting this site is part of our ongoing project to document the aviation material heritage around Newfoundland and Labrador. As such, a permit was obtained and the site was visited, photographed, and recorded with GPS. A metal detector was used to determine the extent of the site (about 1200 m2). A couple of artifacts were removed and are undergoing conservation at MUN. No subsurface testing was done at this site. 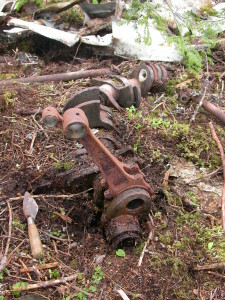 On 15 October 1942 RCAF Hawker Hurricane 1359 crashed near Cochrane Pond as it was returning from a dusk patrol. According to research by Deal (2014), the probable cause was engine failure as there was a glycol leak or an air lock in the fuel line. The engine was too badly damaged in the crash to make a definitive assessment. Flight Sergeant J.W. Gilmartin, who bailed out at 2000 ft. and survived, reported that he tried to restart the engine by changing tanks, pumping the throttle and using the primer. He bailed when this failed. He used his parachute as a signal. Gilmartin was located about an hour after the crash by a local man, William Linegar, who witnessed the crash from his boat. The two walked to the crash, found a nearby road, and were met by an RCAF search party. The archaeological investigation of the site confirmed Linegar’s statement in the incident report that the aircraft took a nose dive before it crashed. It also looked at how much has been removed from the site over the years. 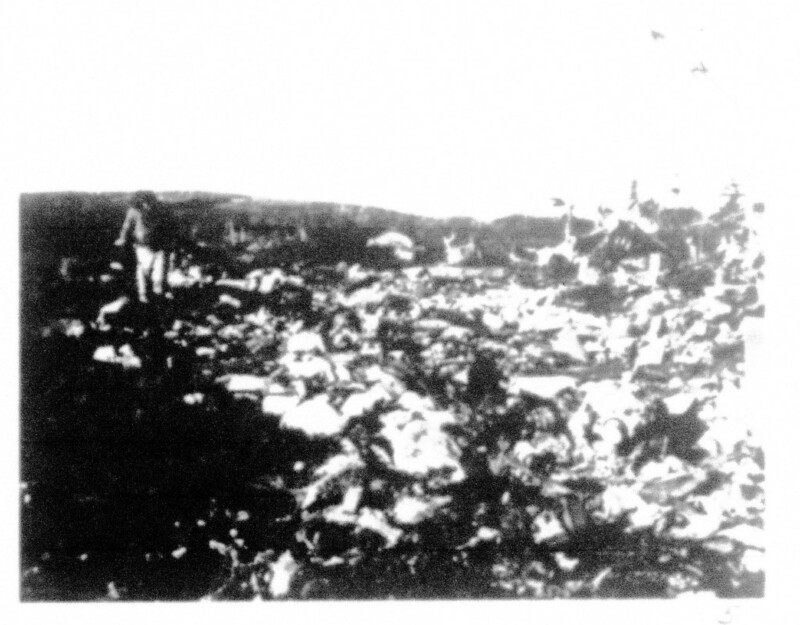 The crash occurred in 1942, and after the crash investigation was completed, locals often visited the site and removed material. The site was forgotten and local aviation enthusiasts had been looking for the site for years. Mr. Ruby located it in 2013 when lumbering operations were undertaken on his property. This site is now classed as an archaeological site. Deal, M. 2014 In Defense of Newfoundland: The Fate of Hawker Hurricane 1359. Provincial Archaeology Office Review, vol. 12, pg. 25-27. Note, sources who have been to this site have informed me that there are still human remains on the site. While the crew is not listed as MIA, this was a high energy, violent crash, and was then lost for almost 4 years. If you know where this site is and visit it, treat it with all the respect due to a place where people died and where their remains rest. 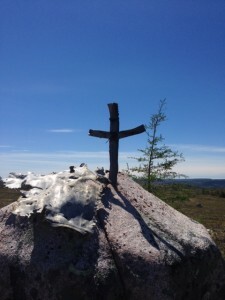 Memorial cross erected by Mr. George on the site. 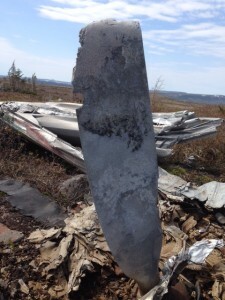 No previous monuments were seen on site. Photo by Barry George. I have misplaced my copy of Christie’s Ocean Bridge, so whenever I find it I may be able to add a little more to this post. For now, I believe that Ocean Bridge lists this aircraft as “missing”. My main source of documentation for this crash is the USAAF Report of Major Accident dated to 1947 and available from AAIR and information from historian Darrell Hillier. Of note is that the USAAF Report has the crash date as 6 March 1944, but many of the original documents copied into the report say the aircraft departed and crashed on 1 March 1944. 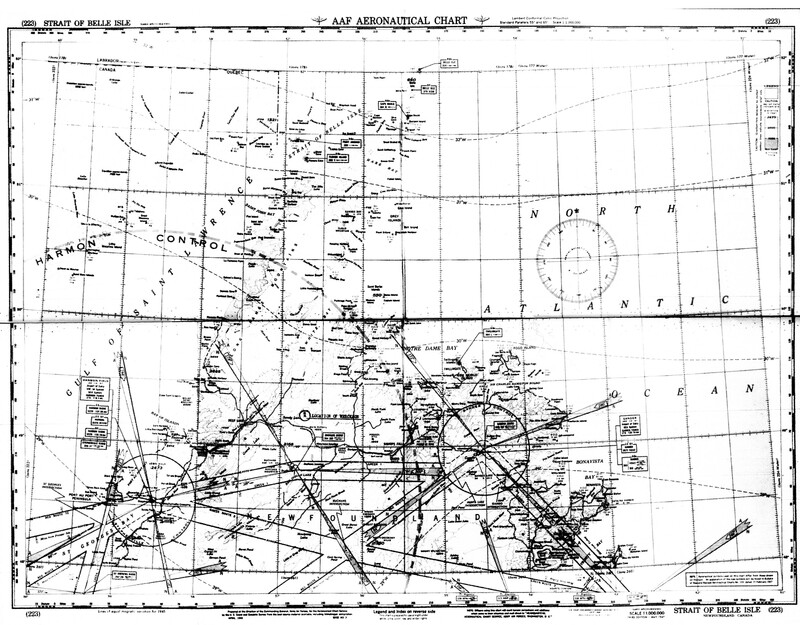 AAF Aeronautical Chart indicating Harmon Control and Gander Control plus the location of the wreckage. From Griffing et al. 1947. 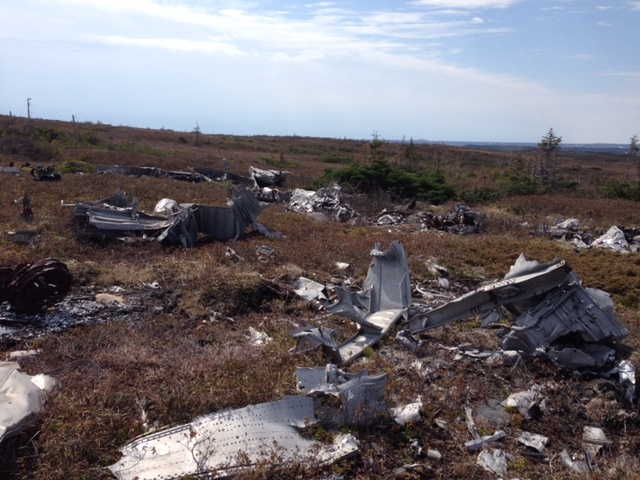 In 1947, an aircraft wreck was located near Gaff Topsails, a railway settlement in central Newfoundland. 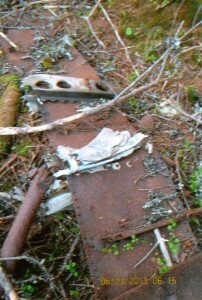 According to the 107 Rescue Unit (RCAF) Torbay diary, a phone call was received on 25 June 1947 that identified wreckage was located near Deer Lake. 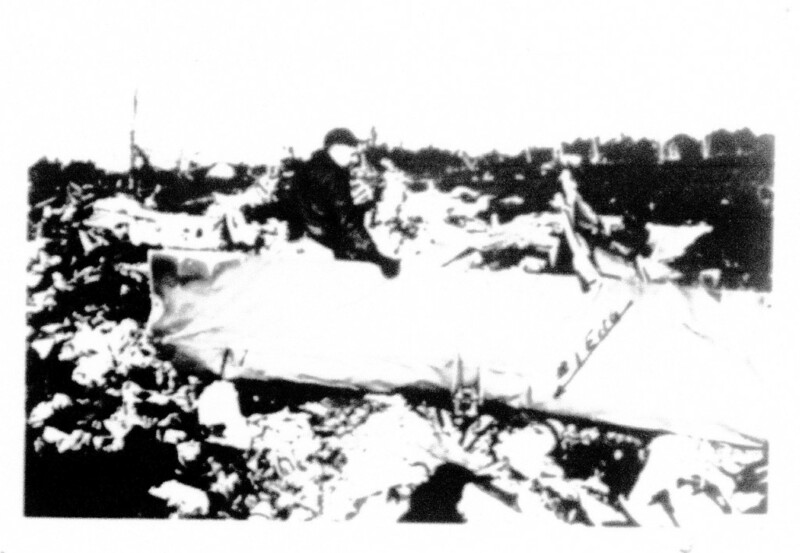 The next day, a ground search team was sent to Harmon Field to check on the wreckage. The crew from 107 returned to Torbay on the 28th and stated that the crash was American and that the Americans had taken over the investigation. American servicemen who were stationed at Millertown Junction went to investigate the site and retrieve the remains. The site was a bit of a mystery to the Americans as the crash had RAF roundels, but yet the remains were brought to the US base at Fort Pepperrell. Hillier’s research determined that the crew was on loan to the RAF from the US 2nd Ferry Group, 63rd Squadron. The aircraft is RAF B-24D CF BZ 935, codename Livestock “K”, which crashed on 1 March 1944 after departing Harmon Field with a destination of Reykjavik, Iceland. As mentioned above, while it was an RAF aircraft, it was being ferried by an Air Transport Command crew. The original destination was Bluie 1, Greenland, but Air Transport Command requested that the B-24 be sent directly to Reykjavik. According to the report, after takeoff there was no radio contact with the aircraft, and as it was an RAF aircraft, when it when missing, Foreign Wing Operations and NAW Operations were contacted and informed that contact was lost and a search for the aircraft was being conducted from Gander. 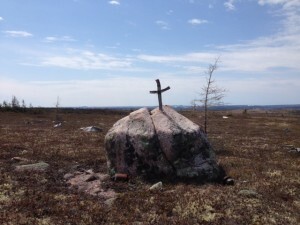 The search was concentrated between Harmon Field and Gander because the last radio contact was Harmon Tower and never checked in at Gander, which lead to the assumption that the aircraft crashed between the two or the radio died. The debris field. Photo by Barry George. Image 6 from the crash report. 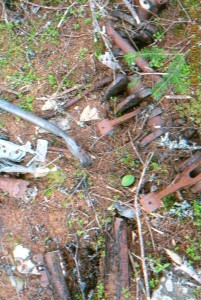 “Photo attachments #6 and #7 [missing] are general view of the wreckage”. Griffing et al. 1947. The knowledge that the aircraft was missing was also delayed due to an error in time reporting. There was a 2 hour and 24 minute delay between the departure of the aircraft and the arrival of the departure message at Gander. There were a number of factors for this. The first was that the time was incorrectly posted to the flight control board in Newfoundland Time (0017NT) instead of GMT (0247Z). As well, 2/3 of the personnel at Harmon Field were new, and had only 2 or 3 weeks experience in operations at the time. Traffic at the time was heavy and there was some confusion with the aircraft because 996 returned to Harmon Field due to a gas leak, and one of the new men mistakenly assumed that it was 935. The message was sent when these errors were discovered. Since the incident, new procedures were put in place to ensure such and error would not occur again. The search itself was delayed until 4 March 1944 due to severe weather conditions. Fifteen RCAF C-47 aircraft from Gander searched for two days, as well as UC-64A from Harmon searched a total of 6.5 hours, L-4B also from Harmon searched for 4 hours over 2 days, and PBY-5A 260 from Presque Isle searched for 2 complete days. 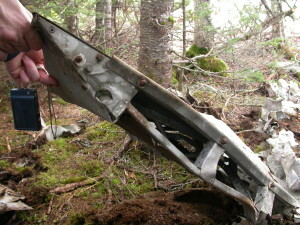 Between the aircraft, the area between Harmon and Gander were searched, with overlap around Buchans. After 6.5 days of searching, all aircraft reported no results. The search was called off, but all aircraft travelling a similar route to 935 were instructed to keep watch for the aircraft. No crash was located by 15 March 1944. Image 1 from the crash report. “Photo attachment #1 shows approximate area circled over which wreckage was distributed.” Griffing et al. 1947. “a weak low northwest of Harmon Field; an intense low centered about Lat. 39 N-48 W.; and a wedge of high running southeast-northwest through Zones 7 and 8, bringing stratus in over the eastern Labrador and Newfoundland coasts. The presence of the Arctic front across Zone 6, bringing an outbreak of Arctic air with resultant cumulus activity over the Denmark Strait” (Griffing et al., 1947). One of the engines. Photo by Barry George. 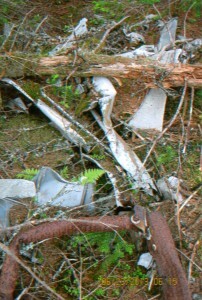 Image 3 from the crash report. “Photo #3 shows exact position of number one engine where imbedded.” Griffing et al. 1947. There are two discovery dates mentioned in the report. On 25 June 1947, a Newfoundland woodcutter named Albert Woolridge found the wreckage and notified RCAF at Torbay “through RCMP channels” (Griffing et al. 1947). A helicopter was provided to transport RCAF Rescue to the scene at a later date. On 3 November 1947, the wreckage was located by Newfoundlanders Fred C. Brake, James Lane and Roderick J. Hickey. 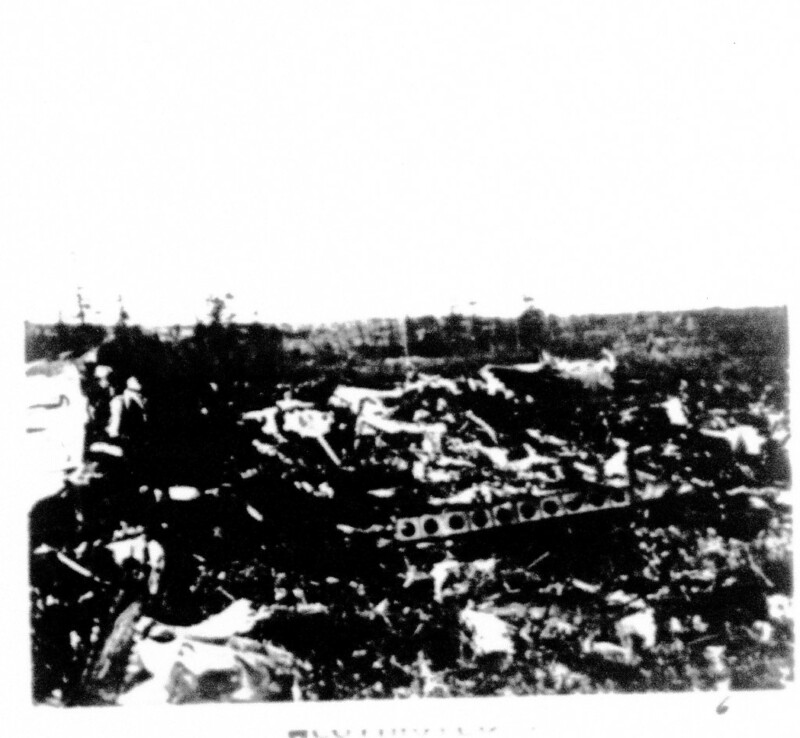 They reported the wreckage to Newfoundland Railroad personnel who relayed the message to Fort Pepperrell. [Note: The official report does not mention any investigation by the RCAF which took place between 25 – 28 June 1947, even though it is mentioned in the RCAF diaries (see above). As the date of the crash is incorrect in the 1947 documents, first as 6 March 1944 and in one letter as 29 February 1944, as a researcher I question the accuracy of the 3 November 1947 date versus the 25 June 1947 date.] The American accident board arrived at the site on 6 November 1947 and had difficulty accessing the site. It is located about 6 miles from the railway and through terrain that was only passable by food. Limited investigative equipment was brought to the site as it had to be brought by back pack. Image 2 from the crash report. “Photo attachment #2 shows the spruce tree encircled [unclear on image], which helped determine the angle at which the aircraft struck the ground.” Griffing et al. 1947. 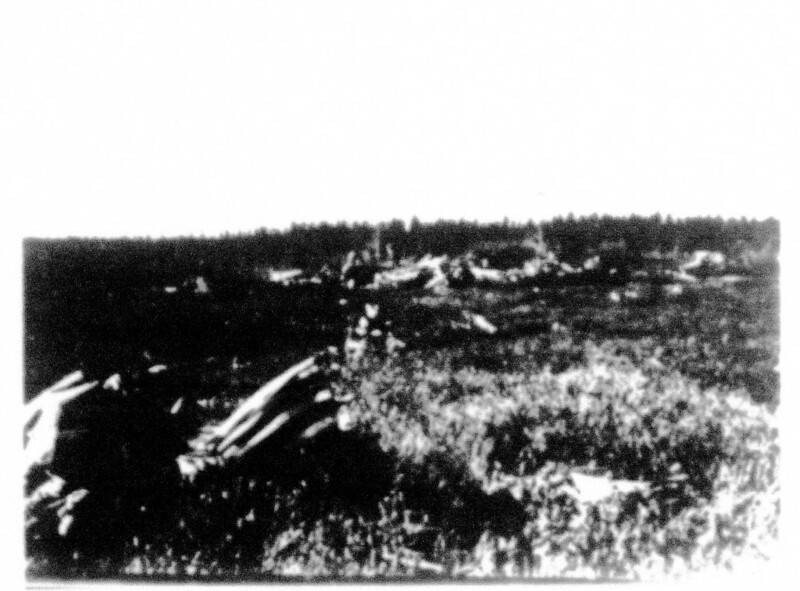 The aircraft struck the ground at an angle of approximately 75 degrees to the horizontal, this was established by the concentration of all four engines in normal alignment at the time and point of impact, and the proximity of a spruce tree circled in Photo #2. Reliable sources establish the fact that this tree was a minimum of four years of age, and was dead at the time of investigation. 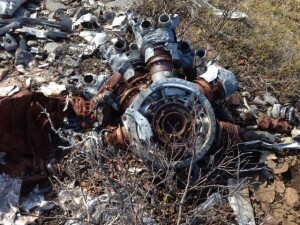 The engines had buried approximately three feet into rocky terrain. It is evident that a violent explosion occurred on impact due to wreckage scattered over an area of 250 yards radius from point of impact. Parts that were to [sic] heavy to be moved by wind or manpower forces, showed evidence or warping or twisting of such sections as Bombay doors, rolled into a ball and found approximately 300 yards from the point of impact. 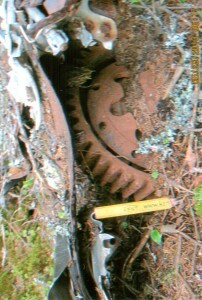 The main gear intact but burned were found 150 feet away. There was no evidence of the aircraft striking the ground at any point other than the place of final resting. Considerable burning occurred after the explosion evidenced by the fact a propeller still intact was partially melted. The largest concentration of heat was appearently [sic] centered around the nose of the aircraft and flight deck, and the area where the engines were imbedded. From all indications the aircraft struck the ground in a near vertical position, and evidently at a considerable rate of speed (Griffing et al,. 1947). 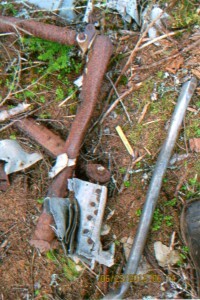 Propeller showing signs of intense heat, indicating the crash burned. Photo by Barry George. 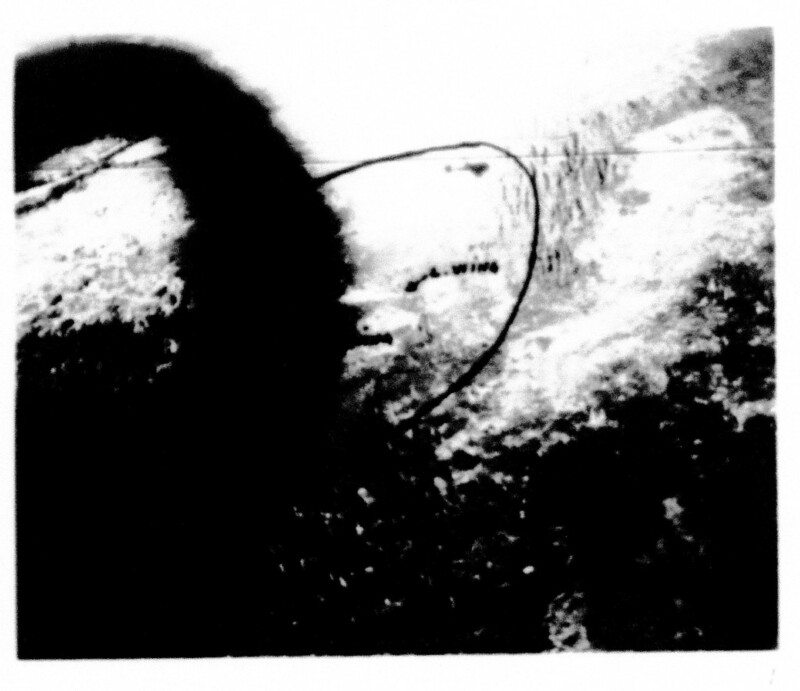 Image 5 from the crash report. “Photo attachment #4 [sic] is general view of wreckage taken from a point near left wing tip and showing area of most intense heat.” Griffing et al. 1947. Overall, the investigation concluded that no cause of the accident could not be determined, nor could any violations of regulations or instructions or human errors be determined. The crew, for the most part, were identified by their identification cards, tags and/or insignia as most of the human remains were heavily fragmented, scattered, and most of the clothing was in poor condition due to the crash and subsequent exposure to the elements. There were no indications of any other site visits prior to 1947 as there were no markings or obvious disturbances found. To mark the site as found, a boulder was painted orange. This way, aircraft overhead would know it was a known wreck, and any future reports or the site would not cause a full investigation. As this aircraft was an RAF vessel with a USAAF crew, there was some confusion about the regulations. Some paperwork was not filled out when the aircraft went missing, but was completed and submitted in September of 1944. This was because it was misinterpreted that because it was an RAF aircraft, the USAAF were not responsible for some of the paperwork because they should be prepared “only on ‘U.S. Army Aircraft'” and not in this particular case. Overall, reading through the reports, there is a lot of conflicting information, from later documents confusing the date of the crash to a discrepancy about who discovered and reported the aircraft and the initial visit by the RCAF. Much of this is possibly due to having to recover documents from almost 4 years previous and information being passed incorrectly between the different parties. A memorial erected by Mr. George. Please note there are still human remain fragments on this site and it should not be disturbed. Photo by Barry George. Once again, please note that there are still human remains on this site. While no one from this crash is MIA, they were also not fully recovered so please treat this site with the respect that any final resting place deserves. Griffing, L.A., Bendowski, S.C., Carmack, H.H., Hull, H.R., and Phillips, A.D.